5th Annual Fun Run – We DID it! Together we raised $31,221! Thanks to EVERYONE who donated and collected funds for our cause. By our Oct. 30 deadline, we raised an outstanding sum of $31,221, beating our 2015 goal AND exceeding last year’s Fun Run donations by $10,000! The classrooms that earned $250 toward their Foundation-held account are: Anander, Bethany, Childers, DeMoney, Drews, Ebert, Ford-Kuntz, Hollandsworth, Kacel, Krakauskas, McCune, Thompson, Ward, and White. We had two classrooms that earned $500 toward their classroom account (which means that they each raised more than $2000 collectively). They were: Ms. Valdez’s 4th grade classroom and Ms. Wendland-Diaz’s 2nd grade. Additionally, Ms. Wendland-Diaz’s students had the most funds turned in by our October 23 challenge so will receive an additional $100 in their classroom fund. Congratulations! Thank you to those who contributed online! Together, you raised $11,537! To view the final list of online contributors, click here. Our Students Ran 1,475 Miles! Results from the Fun Run are quite impressive. 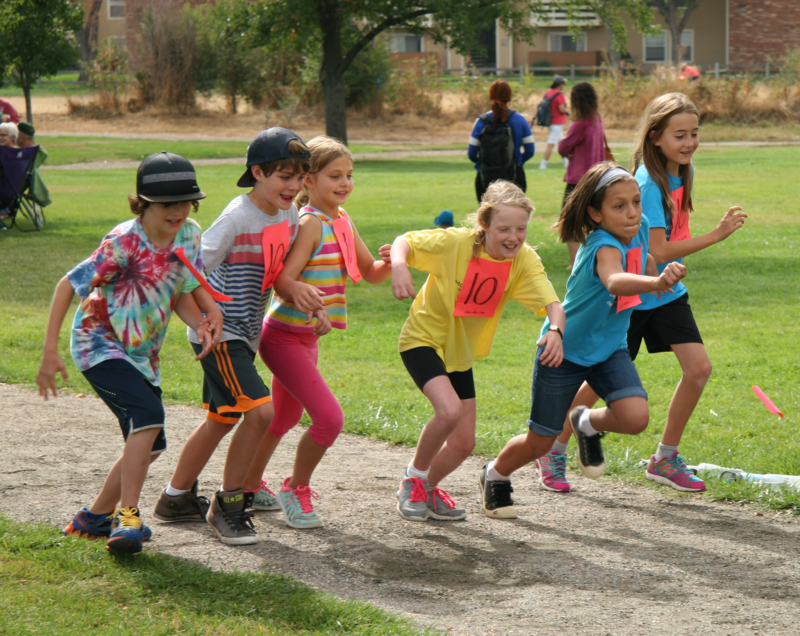 Our first through eighth grade classrooms collectively ran nearly 5,900 laps, or 1,475 MILES! Mr. White’s sixth grade classroom had the most laps, completing 470 laps with 27 students participating. Thank you to all our runners…you are all fabulous! The Fun Run is MPCS’s first fundraiser of the year and is typically one our largest moneymakers. Last year, we raised $21,000 and our goal this year is to raise $25,000. October 1st is Jeffco School District’s Count Day, which means that MPCS receives its per/pupil enrollment funding from the county based on attendance numbers for that specific day. Needless to say, it is extremely important that your children attend school on October 1st. And what better incentive than to have a fun event at a nearby park! In addition, children will be asked to get pledges (for each lap completed) or lump donations from friends, neighbors, family, etc. All of these donations are tax deductible as they go to the 501(c) (3) MPCS Foundation. 5% of the total amount raised will go directly to the PE program at MPCS. Last year, the PE program received $1,000. For every $1,000 raised per class, $250 will be earmarked for that classroom’s specific needs. Last year, 8 classes earned $250 and 1 classroom earned $500. The remaining portion of funds will support professional development for our staff at MPCS. Last year, the Fun Run funded more than $16,000 in professional development. We are utilizing the big track to the south of the play structure (like last year) for the 1st-8th grade runs. PreK and Kindergarten will run their laps on a smaller track right in front of the jungle gyms (new this year). In order for this to be an event that is both fun for the children and a financial success for the school, we need help. Help your children ask family and close friends to sponsor them! Donors can sponsor a flat rate or for students in the grades, they can sponsor per lap. Online Donation Form – This link is perfect for folks wanting to do a flat donation and for sharing with your out-of-town friends, family, etc. to do the same. Encourage your children to “train” in advance for the event so they will be motivated to put their endurance and physical ability to the test. Make sure your children get a good night’s sleep the night before and a hearty breakfast. Plan on coming to cheer our runners on! Plan on running along the race. This is for the children. Instead, cheer from the sidelines and encourage all to do their best!